Seven double bedrooms with A.C. - TV all en-suite. Lift to all floors. Restourant/Wine Bar: a welcoming veranda and diningroom with air conditioning. Wireless internet access is available in all our bedrooms. In our hotel you are treated as a guest rather than a client, and the atmosphere is intended to be more that of a home rather than a hotel. Now completely refurbished throughout, it offers comfortable and modern accommodation. To further the intimate feel, each bedroom is distinctively and charmingly furnished. All our seven rooms have en-suite bathroom, air-conditioning, telephone and television, and two of the bedrooms have a spacious outdoors terrace. 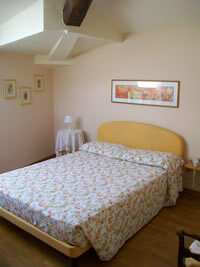 There are also two suites available consisting of bedroom, bathroom and living room area with a small corner kitchen.